Ultrasonic nozzles operate by converting high frequency sound waves into mechanical energy that is transferred into a liquid, creating standing waves. As the liquid exits the atomizing surface of the nozzle, it is broken into a fine mist of uniform micron sized droplets. Unlike pressure nozzles, ultrasonic nozzles do not force liquids through a small orifice using high pressure in order to produce a spray. Liquid is fed through the center of a nozzle with a relatively large orifice, without pressure, and is atomized due to ultrasonic vibrations in the nozzle. 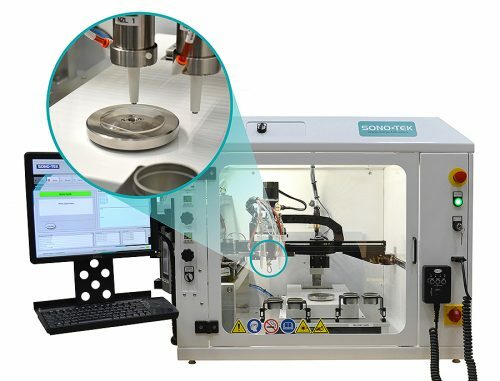 A Sono-Tek engineered proprietary precision ultrasonic generator provides the mechanical energy required to create the vibrations in the nozzle. The power required to operate ultrasonic nozzles generally varies between 1 and 8 Watts. Click here to see a simple animation illustrating the atomization process. Every ultrasonic nozzle operates at a specific resonant frequency, which dictates the median droplet size. Droplet sizes have little variance, and can be mathematically calculated to fall within a tight predicted drop distribution. For example, a 120 kHz nozzle produces a median drop size of 18 microns (when spraying water). The higher the frequency, the smaller the median drop size. Nozzles are fabricated from a very high-strength titanium alloy and other proprietary metals, making them exceptionally resistant to chemical attack and providing superior acoustical properties. The electrically active elements are contained within a sealed housing that protects the nozzle components from external contamination. The liquid feed tube runs the entire length of the nozzle. The nozzle’s design ensures that liquid only comes into contact with titanium within the nozzle. The low velocity mist created by the ultrasonic nozzle is typically accompanied by additional low velocity air shaping devices to entrain the spray and direct it toward a substrate. This allows precise control of the spray into fine lines, conical patterns, or wide flat fan shapes. To learn more about air shaping, visit Air Shaping Systems. Spray patterns range from 0.015” (0.4mm) wide lines to virtually unlimited widths using multiple nozzles mounted in tandem. 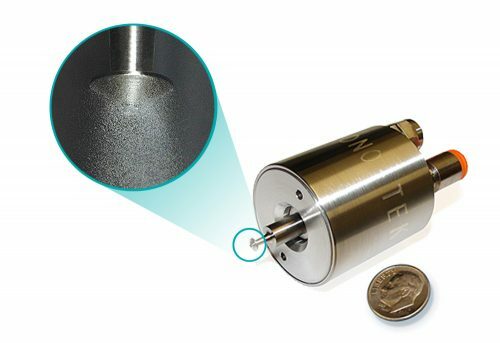 Sono-Tek ultrasonic nozzles are integrated into full coating systems, incorporating liquid delivery, exhaust, motion control, and custom options. The photo shows an ExactaCoat system with dual AccuMist air shaping nozzles, allowing layering of different chemistries.